Even though I don't have a big vegetable garden, I always grow tomatoes. This year I just have one pot of tomatoes and a pot of basil growing on my patio. The tomato plant doesn't look all that great but the tomatoes I have gotten from it have been so sweet and juicy. 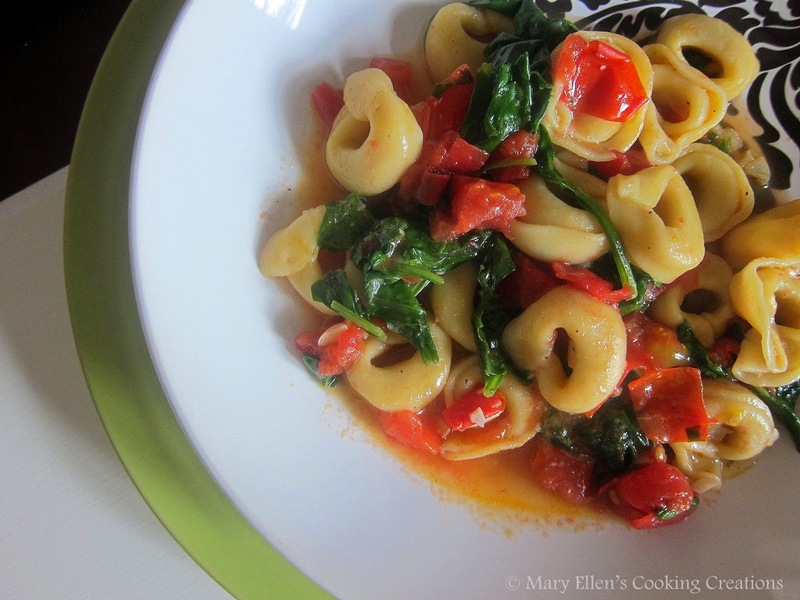 Two of those tomatoes inspired this summer tortellini dish. When I posted the picture of this dinner on Instagram I used the hashtag #tasteslikesummer. Sweet and juicy tomatoes paired with basil are a classic summer combination - don't you agree? It's one of my favorite things about summer so I hope my little potted tomato plant keeps on giving me perfect tomatoes! Once the tortellini has cooked, remove it from the water with a slotted spoon and transfer it to the sauté pan. Add the spinach and toss everything to wilt the spinach. Add the Parmesan cheese and adjust salt and pepper, if needed. Serve garnished with some basil and ricotta salata, if desired.